Objectives: Integrated socio-economic and ecological evaluation of the land use system, modelling of land use scenarios and development of recommendations for sustainable management strategies. Household module: Analysis of social and economic aspects of crop and livestock agriculture.Important spatial economic indi-cators include, for example, the site related yield potential of annual and perennial crops, the working time and fertiliser input. Non-spatial economic criteria like the whole household income and the economic risk are calculated in consideration of all household activities and products. 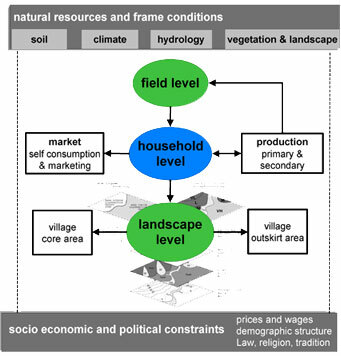 The modeling approach is used to create future landscape scenarios with different agricultural management strategies, including social and economic information’s. For the evaluation of the different scenario results and the changes when compared to the current situation, the economic and ecological indicators are depicted as an amoeba diagram. The different management strategies of a scenarios, such as an enlargement of pomegranate cultivation, an intensification of livestock production or the abandonment of land use as a result of decreasing population density, are evaluated in terms of sustainability, that is maintenance of productivity and income, and of biodiversity. A comparative analysis and evaluation of the scenarios is used to define recommendations for a sustainable regional development.